Today's mental hospital has no patient restraints, walls or bars; it is an abstract and invisible device. It is lodged in the head, it patrols the neurotransmitters that regulate thought. Today, psychotropic drugs are the real mental hospital. Indeed, we are currently witnessing a momentous anthropological muta- tion; for psychiatrists and pharmaceutical companies treating mental patients is not enough anymore, they are out to get healthy people too. Hence, mourning, sadness, anger, shyness, absentmindedness, are not conceived as normal states of mind anymore, but disorders that need to be treated with right drug. 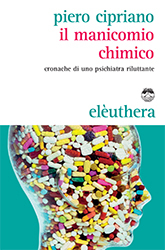 Cipriano's book is a stern critique of all main dogmas of «modern» psychiatry: from diagnostics, i.e. the bureaucratic obsession to define as «mental disorder» any psychological discomfort. If drugs are not effective, physical restraints and electro-shock will do the trick. Today's mental hospital is a harder to perceive, more subtle place where diagnosis and psychotropic drugs rule. Piero Cipriano (1968) is a doctor, a psychiatrist, a psychotherapist, and an ethnopsychiatric. After workingin various mental health departments from Friuli to Campania, in the last few years he is working in Rome in a SPDC health centre.